The Ryder Cup is a golf trophy, donated by Samuel Ryder, which is awarded biennially in an event called the "Ryder Cup Matches" between teams from Europe and the United States . The competition is jointly administered by the PGA of America and the PGA European Tour, and is contested every two years, the venue alternating between courses in the United States and Europe. The competition began following an exhibition match in 1926 between a team comprising American professionals against a similar one drawn from the British PGA on the East Course, Wentworth Club , Virginia Water , Surrey , UK . The first competition took place in 1927. Early matches between the two sides were fairly even, but after the Second World War, repeated US dominance led to a decision to extend the representation of the British & Irish team to include continental Europe in 1979. This change was partly prompted by the success of a new generation of Spanish golfers of the time, including Seve Ballesteros. He and Antonio Garrido became the first Spaniards to play in the event in 1979. Since then, Team Europe has included players from Denmark , France , Germany , Italy , and Sweden . Following this change the event has enjoyed more competitive matches, with Europe winning seven times and retaining the Cup once, with seven American wins over this period. The Ryder Cup Matches involve various match play competitions between players selected from two teams of twelve. Currently, the matches consist of eight foursomes matches, eight fourball matches and 12 singles matches. The winner of each match scores a point for their team, with ½ a point each for any match that is tied after 18 holes. A foursomes match is a competition between two teams of two golfers. The golfers on the same team take alternate shots throughout the match, with the same ball. Each hole is won by the team that completes the hole in the fewest shots. A fourball match is also a competition between two teams of two golfers, but all four golfers play their own ball throughout the round rather than alternating shots, and each hole is won by the team whose individual golfer has the lowest score. A singles match is a standard match play competition between two golfers. The matches take place over three days, Friday through Sunday, a total of 28 matches. On Friday, there are four fourball matches in the morning (or afternoon) and four foursomes matches in the morning (or afternoon). On Saturday, the same schedule repeats. On Sunday, there are 12 singles matches, when all team members play. Not all players must play on Friday and Saturday; the captain can select any eight players for each of the four rounds of play over these two days. The winning team is determined by cumulative total points. Under Ryder Cup rules, the defending champion team from the previous matches only needs to halve the cumulative point totals (14) to retain the Cup, while the opposing team must win it outright (14½ or more). The format has changed over the years. From the inaugural event through 1959, the Ryder Cup was a two-day competition, with four 36-hole foursomes matches on the first day and eight 36-hole singles matches on the second day, for a total of 12 points. In 1961, the matches were changed to 18 holes each, but the number of matches was doubled, resulting in a total of 24 points. In 1963, the event was expanded to three days, with eight fourball matches being added on the middle day to make a total of 32 points. This format remained until 1977, when the number of matches was reduced to 20: five foursomes matches on the first day, five fourball matches on the second day, and ten singles matches on the final day. In 1979, the first year continental European players participated, the format was changed to the 28-match version in use today, with eight foursomes/four-ball matches on the first two days and 12 singles matches on the last day. In 2008, the format for the event changed versus the previous two Ryder Cup Matches. For the first time since 1999, the opening matches of a Ryder Cup featured the foursome (alternate-shot) format. U.S. captain Paul Azinger, hoping to give his team an early advantage in Kentucky , announced the change on January 30, 2008 at the PGA Tour's FBR Open in Phoenix. Alternate shot, or foursomes, had been used in the first sessions every year since 1981 until European captain Seve Ballesteros opened with better ball (fourballs) in 1997 at Valderrama . U.S. captain Ben Crenshaw switched back to alternate shot in 1999 at Brookline, but the next three Ryder Cup matches started with better ball. The latest competition of 2008 however returned to the foursomes format. There are two qualifying sections used for the European selection: The European Tour list and the Official World Golf Rankings points list. The way in which the United States team is selected was revamped for the 2008 competition. Qualification for the United States team began with the four major championships contested in 2007, and continued from January 1, 2008 until August 11, 2008. The top eight players will automatically qualify for the 2008 United States Ryder Cup Team, with the remaining four places reserved for captain’s picks. The captain made those picks on September 2, 2008. Prize money earned in the 2007 Masters Tournament , U.S. Open, Open Championship, and PGA Championship – one point for every US$1,000 earned. Prize money earned in official events in 2008 from January 1 until August 11 – one point for every $1,000 earned, excluding major championships and events played in the same weeks as major championships and World Golf Championships. Prize money earned in the 2008 major championships – two points for every $1,000 earned. Prize money earned in 2008 events played in the same weeks as major championships and opposite World Golf Championships between January 1 until August 11 - one-half point for every $1,000 earned. 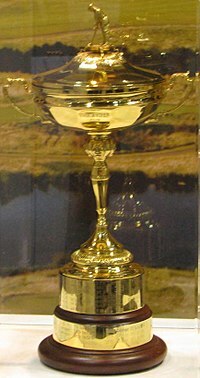 The Ryder Cup on display in 2008. There is some debate over who suggested the idea for the Ryder Cup. James Harnett, a journalist with Golf Illustrated magazine, appears to have proposed a similar idea to the USPGA on December 15, 1920 and, having failed to attract support, the idea was refloated by Sylvanus P. "SP" Jermain, president of the Inverness Club , the next year. This resulted in an unofficial match in 1921, won 9–3 by the British, and another in 1926, won 13½–1½ by Britain. Present at the second 1926 match, held on the East Course at Wentworth Club , Virginia Water , Surrey , was Samuel Ryder, a seed merchant who traded from St Albans , Hertfordshire . Having watched the play, Ryder thought it would be a good idea to make the match official and thus the Ryder Cup was founded, with Ryder donating the trophy. Few people who took up golf after their 50th birthday have left as many positive impressions on the game during the history of golf. To get started, Ryder recruited the services of a golf professional called Hill from a local golf course to introduce him to the fundamentals of golf. Afterwards, Ryder hired Abe Mitchell as his private tutor for a fee of £1,000 per year. Ryder received most of his lessons at his home, Marlborough House, and he was relentless. He practised his driving, pitching and putting six days each week. At the age of 51, he had achieved a handicap of six and was accepted as a member of the Verulam Golf Club in St Albans in 1910. A year later, he became captain of the golf club. He was also club captain in 1926 and 1927. In 1923, he sponsored the Heath and Heather Tournament, which was only open to professionals. One of the golf professionals who took part was ex-gardener Abe Mitchell, considered one of the best British golfers of his era. Among the British at the 1926 landmark match were golfing giants Abe Mitchell, George Duncan, Archie Compston, Ted Ray (portrayed by Stephen Marcus in the 2005 film The Greatest Game Ever Played), and Arthur Havers. From America came Walter Hagen, Tommy Armour, Jim Barnes and Al Watrous. This first official match was held in Worcester, Massachusetts , at the Worcester Country Club, in 1927. Ryder, who donated a gold cup and had agreed to pay £5 to each member of the winning team, attached his name to the new competition. Since 1927, it has been held on a two-year cycle, apart from 1939 to 1945, when it was cancelled due to World War II. Until 1971, the matches featured teams from the United States and Great Britain. From 1973 to 1977, players from the Republic of Ireland were eligible to join the British team, and since 1979 inclusive, players from the continent of Europe have been eligible to join what is now known as Team Europe. The change to include Europeans arose from discussion in 1977 between Jack Nicklaus and the Earl of Derby, who was serving as the President of the Professional Golfers' Association; it was suggested by Nicklaus as a means to make the matches more competitive, since the Americans almost always won, often by lopsided margins. The change worked, as the team matches immediately became much more competitive, with talented young Europeans such as Seve Ballesteros and Bernhard Langer bolstering the European side. The present-day popularity of the Ryder Cup, which now generates enormous media attention, can be said to date from that change in eligibility. The 2001 match was delayed for a year, as it was due to take place shortly after the September 11 attacks. It was subsequently decided to hold the Ryder Cup in even-numbered years instead of odd-numbered years. The boards at The Brabazon Course at The Belfry , which hosted the 2002 Ryder Cup (which should have been hosted in 2001) still read "The 2001 Ryder Cup", and U.S. captain Curtis Strange deliberately referred to his team as "The 2001 Ryder Cup Team" in his speech at the closing ceremony. Europe claimed their first hat-trick of victories in 2002, 2004 and 2006: this was particularly surprising as no European player won a major championship in that time period (Americans won fifteen). The 1969 Cup held at Royal Birkdale was perhaps one of the best and most competitive contests in terms of play (18 of the 32 matches went to the last green), but it was also marred by acrimony and gamesmanship between some players. In one of golf's most memorable moments of sportsmanship, Jack Nicklaus, playing in his first Ryder Cup Matches, conceded a two-foot putt to Tony Jacklin after making a four-footer for par on the last green. The 'gimme' was very generous; Jacklin was far from assured of making it. Nicklaus said: "I don't think you would have missed that putt, but in these circumstances, I would never give you the opportunity." The result was the first tie in the Matches' history (the US retained the Cup), but some of Nicklaus' teammates were less than pleased, including captain Sam Snead. After accusing each other of cheating at The Belfry in 1989, the feud between Seve Ballesteros and Paul Azinger escalated at the Kiawah Island Golf Resort in 1991. Azinger said, "I can tell you we're not trying to cheat." Ballesteros replied, "Oh no. Breaking the rules and cheating are two different things." The constant goading intensified their desire to win and with their partners, José María Olazábal and Chip Beck respectively, they produced what is regarded as the best pairs match in history, with the Spaniards winning 2 & 1. The 1999 Ryder Cup held at The Country Club in Brookline, Massachusetts , caused great controversy. A remarkable comeback by the American team helped propel the U.S. to a 14.5–13.5 victory after trailing 10–6 heading into the final day. The U.S. went 8–3–1 in the singles matches to seal the first American victory since 1993. The competition turned on the 17th hole of a match between American Justin Leonard and Spaniard José María Olazábal. With the match all square at the 17th hole, Leonard needed to earn at least a half-point by either winning one of the last two holes (therefore earning a full point), or finishing the match at all square (therefore earning a half-point) to seal an American victory. After Olazábal's second shot left him with a 22-foot putt on the par-4, Leonard hit his shot within 10 feet of the hole and then watched it roll away from the cup, leaving him with a 45-foot putt for birdie. While sinking a putt of this length is unlikely, Leonard had made putts of 25 and 35 feet earlier in the round. Leonard holed the astounding putt, and a wild celebration ensued with other U.S. players, their wives, and a few fans running onto the green. Had Leonard's putt sealed the match, this type of behavior would have been inappropriate but moot. Knowing that a made putt would extend the match while a miss would assure Leonard of a half-point and the U.S. a victory (the Americans needed 14.5 points to gain the cup due to the Europeans' 1997 victory at Valderrama), Olazábal tried to regain his focus. However, he missed the difficult putt, and the American team celebrated once again (although the second celebration was more reserved than the first one). According to the "Best of the Rest" section of ESPN's Top 5 Reasons You Can't Blame program, NBC television footage and press photos prove that no official rules (Ryder Cup or PGA) were broken when the Americans celebrated after Leonard's putt (i.e. no one walked in or crossed Olazábal's putting line). However, the game of golf is upheld by many to be "the gentleman's game", and there remain a number of unwritten rules and codes of conduct which the European players believe were being ignored. Many of the American players believed the Europeans' response was hypocritical; they argued that European players - in particular Seve Ballesteros - had been guilty of excessive celebration and gamesmanship as far back as the 1985 Ryder Cup Matches, without attracting the same opprobrium from the European media.There was still considerable bad blood after the match, with some of the European players complaining about the behavior of the American galleries throughout the match. Sam Torrance branded it "disgusting," while European captain Mark James referred to it as a "bear pit" in a book recounting the event. There were also reports that a spectator spat at his wife. Following the 1999 Ryder Cup, a number of members of the U.S. team apologized for their behavior, and there were numerous attempts by both teams to calm the increasing nationalism of the event. These efforts appear to have been largely successful with subsequent Cups being played in the "spirit of the game". (Rotherham , Yorkshire , England ) Great Britain 7½ 4½ United States Jack Burke, Jr.
* - Delayed one year due to September 11, 2001 attacks. NB:The 1939, 1941, 1943, and 1945 tournaments were canceled due to World War II. The 1969 and 1989 tournaments were drawn, so the Cup remained with the previous victors. 1929–1969 Team Great Britain were the hosts of their home Ryder Cup Matches. 1973 and 1977 & Team Great Britain & Ireland were the hosts of their home Ryder Cup Matches. 1979– Team Europe are hosts of their home Ryder Cup Matches. Solheim Cup — The women's equivalent of the Ryder Cup, featuring the same U.S. vs. Europe format, played in the years the Ryder Cup is not held. Presidents Cup — Men's event, held in odd-numbered years, with a format similar to the Ryder Cup, except that the competing sides are a U.S. side and an International side consisting entirely of players whose citizenship makes them ineligible for the Ryder Cup. Handa Cup — The senior women's equivalent, featuring a U.S. team versus a European team. Walker Cup — Event for amateur men. Unlike the Ryder Cup, the Walker Cup has never adopted a U.S.–Europe format. The U.S. side is opposed by a team drawn from Great Britain and Ireland. Curtis Cup — Women's amateur event directly analogous to the Walker Cup. Like the Walker Cup, the competition format is the U.S. versus Great Britain and Ireland. Lexus Cup — Women's professional event held annually beginning in 2005 and sanctioned by the LPGA. The competing teams are an Asia team and an International team of players from the rest of the world. UBS Cup — A discontinued event for men similar to the Ryder Cup and Presidents Cup. The competing sides were USA and Rest of the World. Six golfers on each side had to be 50 or over, and the remaining six in their forties (2001-2004). Seve Trophy — A European professional men's event, founded by Severiano Ballesteros, that pits a side from Great Britain and Ireland against one from continental Europe. Tommy Bahama Challenge — An annual professional men's event, operated by the U.S. PGA Tour, that pits USA and International (rest of the world) professionals no older than 30. Palmer Cup — An annual match between U.S. and European college/university golfers. Tavistock Cup — An annual match between Isleworth and Lake Nona country club featuring some of the world's best professionals. Chrysler Cup — A former event between United States and International senior professionals (1986-1995). Dynasty Cup — Men's event, held in odd-numbered years, with a similar format as the Ryder Cup, between Japan Golf Tour and Asian Tour golfers, started 2003. Royal Trophy — An annual match between Asia and Europe, started 2006. A Seniors Presidents Cup is scheduled for launch in 2009, and is planned to be held annually. The participating sides, all of whose members will be 50 and over, will be U.S. and International, like the main Presidents Cup. However, the International side in this competition will include Europeans. Britain won only once from 1947-77, and matches were frequently very one-sided. The first golfer from Ireland to play on the Ryder Cup team was Harry Bradshaw in 1953. Fred Daly from Northern Ireland first played in 1947. The figure of the golfer on top of the gold trophy is purported to be Abe Mitchell, the professional who taught Samuel Ryder how to play the game. Jack Nicklaus: My Story, by Jack Nicklaus with Ken Bowden, 2002. The Atlanta Athletic Club still exists, but it sold the 1963 Ryder Cup course in 1966 to finance its move to what is now Johns Creek, Georgia. The 1963 course is now known as East Lake Golf Club.